Once again, I didn't stick to my menu plan last week. However, with my folks here for most of the week we still ate at home with the exception of one night when we ordered in Pizza. My calendar is free this week. We have camping booked for the weekend, but might need to cancel it, we'll see how much I can get done this week preparing our trailer. As always, click on the pictures to be directed to the link. 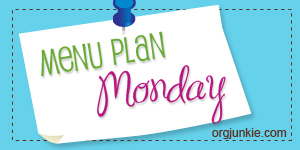 And be sure to check out The Organizing Junkie for a ton more menu planning ideas.